Tanya Clayton | University of Alaska-Fairbanks Dec 20, 2018. Lead author Chris Maio, an assistant professor of coastal geography at the UAF College of Natural Science and Mathematics, reported the findings on Dec. 14 at the American Geophysical Union’s fall meeting. One such situation occurred in 2013. After several villages were so damaged by a series of severe storms that a federal presidential disaster declaration was issued, the village of Newtok and 15 others applied for disaster recovery funding. 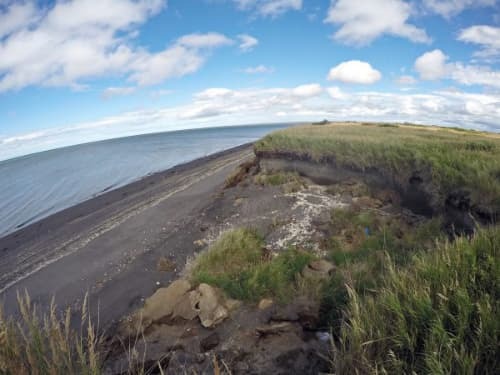 The research team, which also included the Alaska Division of Geological and Geophysical Survey’s Coastal Hazard Program, worked with local coordinators in 10 Bristol Bay communities. People of all ages participated in interactive training sessions on simple, low-cost methods for measuring erosion and maintaining monitoring sites. Since the initial project, more than 20 Alaska villages have agreed to participate. Increased funding from organizations such as Alaska Sea Grant, UAF and the Bureau of Indian Affairs, as well as from the villages themselves, underscores that agencies and villages recognize the value of the study.